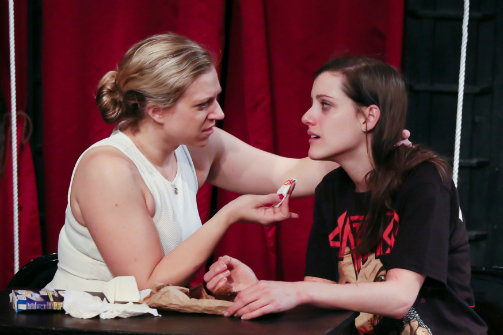 Anna Van Valin and Taylor Shurte in Not Afraid. Photo by Lee Wexler/Images for Innovation. BOTTOM LINE: A play that tackles everything from metal to movie night, but has it bitten off more than it can chew? Sorry metalheads and headbangers, this is not a concert and there is no mosh pit. But, Not Afraid still offers some non-conformity to sink your teeth into. Set in a dodgy Chicago apartment, this story follows two friends who are trying to survive life, adulthood, and disappointment. The play covers a gamut of topics including metal, communism, relationships, fidelity, death, suicide, and general hypocrisy. Complete with a dark sense of humor and stage blood there is always something going on in this new play...perhaps too much. Bets (Taylor Shurte) and Hunter (Anna Van Valin) are long time roommates who are completely in sync. They know each others' quirks, habits, likes, dislikes, and have no problem speaking with unbridled honesty. Yet, they could not be any more different from each other. Bets is a metalhead and devout communist who writes a blog about death metal, politics and, well, death. She has taken it upon herself to rebel against the capitalist system even though she depends on her grandma’s inheritance and her parents' money to survive. Hunter is a law student who shamelessly admits to her capitalist goals to make as much money as she can get her hands on. Despite her law background, Hunter fails to follow any conventional rules regarding her relationship with Robbie (David Register) or any aspect of her personal life for that matter. Their lives really spin out of control when Bets begins receiving death threats from one of her readers for her communist beliefs. On top of trying to keep her friend alive, Hunter has her own demons to tackle. She just accepted a job offer in Cincinnati, and she does not know how Robbie and an already unstable Bets are going to handle the news. Throughout the story Bets and Hunter pause to discuss their experiences with politics, love, death, and college. Both Shurte and Valin do an excellent job embodying their characters and their inherent contradictions. They play women who have a lot to say about how the world works (or should work), but their actions rarely support their philosophies. These contradictions create intriguing characters with very complex issues. However, some of their conflicting traits are so shocking they are almost unbelievable. As the death threats escalate, “The Man” (Register) begins leaving blood smears (and then some) at the house. Yet Hunter, the law student, begins cleaning up the mess before Bets even calls the police. A lawyer with no regard for evidence walks a fine line between character and caricature. That being said, Shurte and Valin work wonderfully together on stage, becoming believably best friends. Even in the worst of arguments there is always a sense of caring or compassion between the two women. The design also works very well with both the world of the play and the physical space. The use of rope to define and shape the stage communicates the dingy and low budget life these women lead. At the same time the rope allows a kind of transparency – Bets and Hunter know each other so well there is little left to hide, and we the audience get to see just about all of their secrets. As for the play itself, Nora Sørena Casey has written a very intelligent story and the subtext provides plenty of food for thought. She addresses various issues with confidence and intensity. I just wonder if amongst the long and rambling debates and the subliminal warnings of Bets’ depression if Casey tried to cover too much ground. Her play addresses so many topics that it becomes almost too “heady,” so to speak. Not that there is anything wrong with a cerebral play, but sometimes more can be said when you give yourself fewer topics to explore. If you are looking for a new and experimental play, Not Afraid fits the bill.